DORO - FOREVER WARRIORS VINYL (2LP BLACK) | Online Shop | Wizard LTD. Album: "FOREVER WARRIORS VINYL (2LP BLACK)"
- NUCLEAR BLAST EXCLUSIVE ONE-SHOT VINYL CAMPAIGN! ЕДНОКРАТНО НАМАЛЕНИЕ!! СЛЕД ИЗЧЕРПВАНЕ НА ОПРЕДЕЛЕНИТЕ КОЛИЧЕСТВА ЦЕНАТА СЕ ВРЪЩА НА СТАРОТО НИВО! This is DORO&apos;s 20th album - and it&apos;s arriving just in time for her 35th live stage anniversary! And yet it&apos;s not just these two great anniversaries that make »Forever Warriors, Forever United« a truly extraordinary album. It&apos;s also not just the fact that the metal queen is releasing her very first double album. No, »Forever Warriors, Forever United« is so special because DORO presents 25 (!) brand new hot tracks that all have one thing in common; an incredible variety and stylistic range, paired with the highest quality. There is simply no weak song on this album – it’s "All killer, no filler!" On »Forever Warriors, Forever United«, DORO delivers a musical firecracker with an unbelievable amount of hits. From stadium anthems to ballads, from heavy metal to classical - the queen of rock & metal proves beyond doubt on this double album that she rules all facets within the rock genre (and far beyond)! And: »Forever Warriors, Forever United« is also more than just a double album – it’s actually two new DORO albums in one! On »Forever Warriors«, DORO presents herself as a wild warrior. Listen to the tracks &apos;Bastardos&apos;, &apos;Blood&apos;, &apos;Sweat And Rock&apos;n&apos;Roll&apos; or the first single &apos;All For Metal&apos;. In this ultimate metal anthem, icons such as Mille of KREATOR, Chuck Billy, SABATON and the unforgettable Warrel Dane have contributed to the song as well as to the video. Speaking of guests; "I&apos;m thrilled that two amazing guest musicians are playing guitar on the new album," says DORO; guitarist Doug Aldrich (WHITESNAKE, DIO, DEAD DAISIES) and former WARLOCK guitarist Tommy Bolan, who also contributed to the highly acclaimed album »Triumph And Agony« in 1987. Speaking of beasts, prepare yourself for &apos;If I Can&apos;t Have You, No One Will&apos;, the duet with AMON AMARTH bellower Johan Hegg, which will be released as the 2nd Single. This song contains brute force that will hit you right in the face. You have never heard DORO like this before! 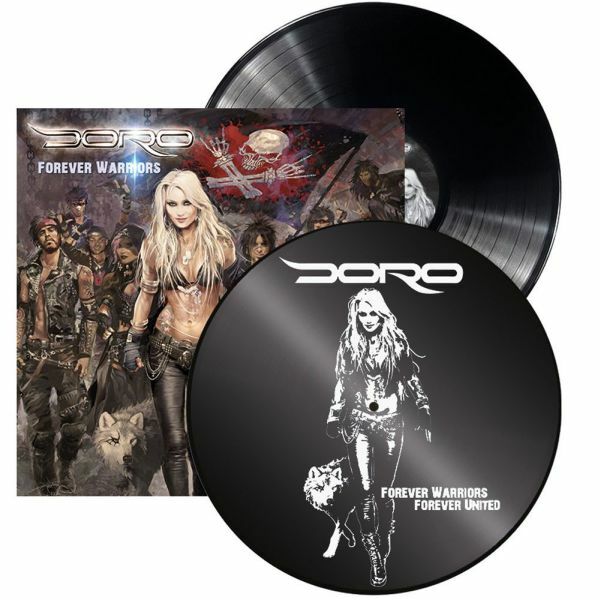 Consequently, DORO presents their fans with »Forever Warriors, Forever United« two new albums in a double package - with 19 regular tracks and six bonus songs that are full of great surprises. The album includes the MOTÖRHEAD cover &apos;Lost In The Ozone&apos;, in honour of Lemmy, as well as &apos;Don&apos;t Break My Heart Again&apos;, an outstanding cover version of the WHITESNAKE hit. Doro: "I have a very deep personal connection to &apos;Lost in The Ozone&apos; and WHITESNAKE have always been one of my absolute favorites. That&apos;s also why my first ever band was called SNAKEBITE!"